We’re kicking off a whole summer filled with giveaways. First up, enter to win a package of my Best of Barbecue grilling tools. This is your chance to give Dad an extra gift for Father’s Day. All the products have the Raichlen stamp of approval, so I’m sure you’ll consider these tools essential to your grilling arsenal by the end of the summer. The set of tools includes my 4-Compartment Grilling Basket, Ultimate Rib Rack, Ultimate Fish Grilling Basket, and Infrared Thermometer. 4-Compartment Grilling Basket: Use this basket to grill a whole meal or four separate items at once, while being able to turn the food easily. Ultimate Rib Rack: This rack fits everything from small baby backs to jumbo beef ribs. Grilling the ribs vertically saves space, so you can cook four full racks on a small kettle grill. Ultimate Fish Grilling Basket: This basket solves the age-old problem of how to grill fish without having it break apart or stick to the grill grate. The extra-large design holds a whole salmon, snapper, or other large whole fish. The handle detaches so you can close the grill lid. 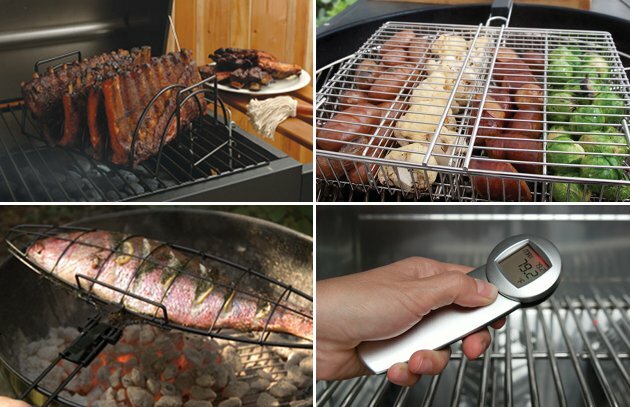 Infrared Thermometer: Use this thermometer to measure the surface temperature of grills, pizza stones, skillets, grids, or other cooking surfaces. It displays the temperature reading in three seconds. Want to explore more tools? We have a huge variety in the BarbecueBible.com store. Check it out!